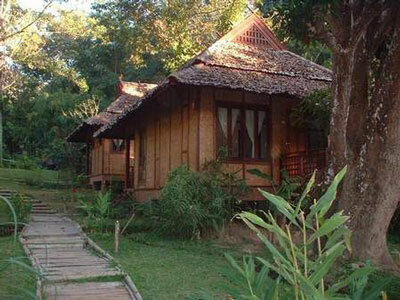 The scattering of wooden bungalows is built on rice paddies in local Shan style with simple yet comfortable facilities. Every effort has been made to keep the resort totally in keeping with the natural environment including keeping the electricity cables buried underground and oil burning light torches for atmosphere in the starlit evenings. The superior bungalows are made of wood and stones in traditional Thai style and provide 2 beds, a fan, a bathroom with toilet and shower with hot and cold water. - Open-Air Restaurant- Barbecue Place- Swimming Pool- Lounge and Lobby furnished in local style- Laundry Service- Karen Handicraft Corner- Free shuttle-service to/from the airport and town !!! You can enjoy cooling off in the swimming pool after your activities during the day. It is surrounded by mountain views and native bush.